Our customer contact information and service hours are to the right. Please read our return instructions first on our Policies page, then contact us by email or phone for instructions on where to return your purchase. Since different products ship from different locations, we need to give you the correct return address to avoid any additional shipping/restocking fees. For interviews/speaking requests, or media inquiries, please see our Press Kit page. If you'd like to have Ken come speak in your area or hold a phone teleseminar or online webinar for your group, contact us at the phone or email address to the right and we can discuss options. See our newsletter page to subscribe to our email list. We receive too many requests to speak with Ken Rohla to honor them all, however, you may contact us and we can discuss options to get you in touch. The best way to personally connect with Ken is by visiting him at one of his live events. See our events page for upcoming events. Unfortunately Ken Rohla is too busy working on projects to benefit humanity and travels too much to perform consultations. If you need help with a health issue, we recommend contacting one of the practitioners on our Services page. Products that we manufacture are offered at wholesale cost to retailers with a valid sales permit ID for the purpose of resale only. 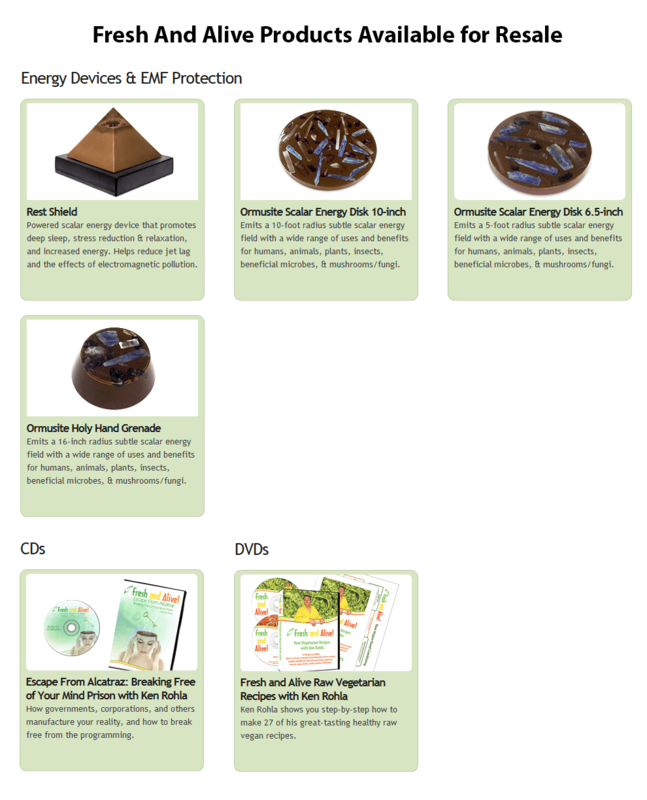 (See a list of our products available for resale here.) We do not wholesale products from other manufacturers, please contact the respective manufacturers if you'd like to sell their products. If you would like to be a reseller of our products, please complete our online wholesale account application. Also download, print, sign, and return our paper wholesale distributor agreement at http://wholesaleapp.freshandalive.com. A customer service rep will contact you shortly afterward. We receive many requests to forward or share information about worthwhile events, products, and services with our mailing lists. We cannot honor such requests. We do not have the resources to promote others products or services, and there are so many worthwhile ones, it would be unfair to pick and choose. Also, we only share information with our lists that Ken Rohla has personal experience with and can recommend. If you would like Ken to be involved with your event or evaluate your product or service, you are welcome to contact us.